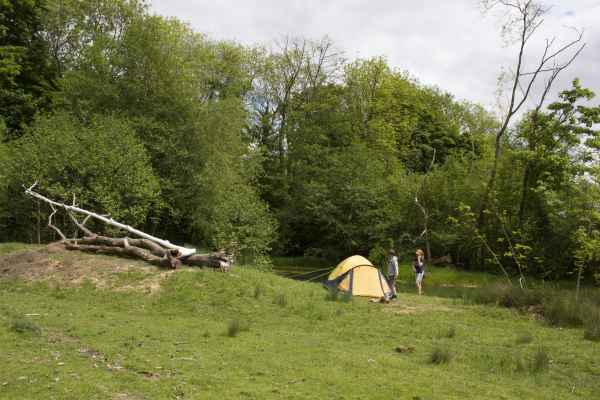 So what kind of places can you go Nearly Wild Camping? I want to give you a flavour of some of the different locations that are involved in this summers trial, so I am going to do a few case studies of different places. First up is Underhill Farm, where all of this started. Nestled beneath the limestone cliffs of Llanymynech rocks Nature Reserve, just a stones throw from the Welsh border lies Underhill Farm. Bought by the Evison family in 2009 it had been empty since 1961 and was in need of quite a bit of TLC. 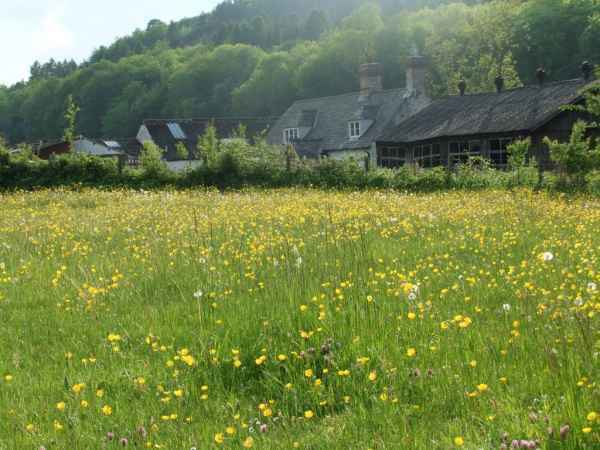 Now four years on, after lots of hard work, it is a quiet smallholding, managed for wildlife and people following permaculture and ecological principles, where visitors can come and relax and explore. There are two fields, one is pasture with two large ponds, a couple of yurts, a tepee and space for camping, backed by woodland and the Llanymynech rocks, there are often peregrine falcons screaming overhead and at this time of year there are lots of dragonflies hawking around the ponds and the woodpecker nesting in the ash tree. The other field is also partly pasture, but with a range of different fruit and nut trees planted on it, a wildflower meadow and small copse at the bottom and a play and exploration area in one corner. The small flock of Jacobs sheep, will be roaming one of the two fields depending on what other activities are going on at the time. The beautiful black and white buildings are all functioning now, with some providing accommodation and others providing a dry indoor space for cooking, eating or wet weather activities. There is also a small, but diverse veg patch, growing food for the Evison family and the WWOOFers who come to stay. 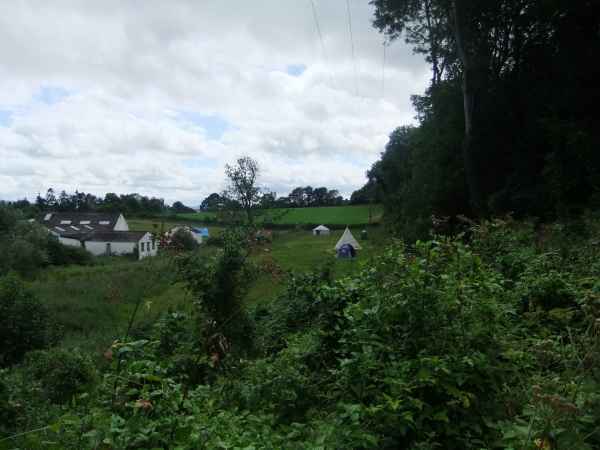 There is quite a range of facilities at Underhill Farm and it is right on the edge of Pant village with a pub and a shop, so it would definitely be categorised as a one star location, but that doesn’t mean that it doesn’t still feel like a secluded, wild corner. The facilities are purposefully basic, but for those who wouldn’t feel comfortable without them there is a flushing toilet, a shower (made out of an old plastic mains pipe! ), a basic kitchen (although people are encouraged to cook at the fire pit), picnic benches and an indoor seating area. There are also informal activities running throughout the summer (another Nearly Wild initiative), which encourage and help people to explore the history, culture and wildlife of the area. Underhill Farm was started to provide an alternative for those who wanted a wilder experience, but weren’t willing to head out into the middle of nowhere with no facilities. It has become clear that there are many people looking for this kind of opportunity and that is partly where the idea for Nearly Wild Camping came from. Wouldn’t it be wonderful if there was a network of locations offering a similar thing, and catering for a range of different definitions of wild, across the country? Most often the answer to that question is yes, so that’s what we are trying to create!